activities intended to boost the chiropractic profession’s profile and increase its influence on Capitol Hill and within the White House. For more than a year, the American Chiropractic Association (ACA) has spearheaded an aggressive lobbying and grassroots campaign targeting the critical issues of national health care reform and expanding the role of DCs in the federal Medicare program. ACA has invested hundreds of thousands of dollars in grassroots communications, database management, staff time, public and media relations, advertising, and targeted lobbying activities for the benefit of the entire chiropractic profession. These activities, along with the association’s cooperative efforts with other organizations through the Chiropractic Summit process, have substantially advanced chiropractic’s issues on Capitol Hill. Funds raised through CHAMP will enable ACA to further capitalize on this progress. 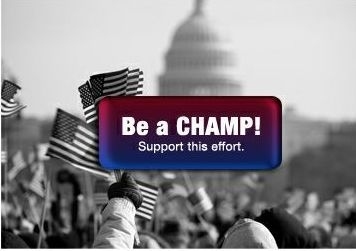 During this crucial time of change in our health care system, ACA established CHAMP to ramp up its ongoing government relations activities—ensuring that chiropractic’s voice and message are heard loud and clear.